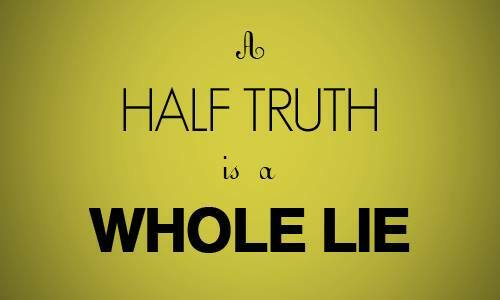 Half-truth is heresy, and everyone living in half-truth is living an erroneous life. That is the gospel many are carrying about today. Heresy means overemphasizing a part of truth and leaving the other part behind. Many and modern church of today are perfect illustration of heresy, they are overemphasizing some part of the scriptures that sooth them and leaving other parts behind. That is half-truth of heresy. Though they claim what they are preaching is from the Bible, they quote the Bible to back what they preach, but they are preaching heresy – uncompleted truth. They emphasize on “NO CONDEMNATION” but they ignore the message of “NO CONTINUITY IN SIN” and many Christians are falling victim of this permissive heresy. The complete truth of the Gospel of Jesus Christ was demonstrated in John 8:11, when Jesus met the harlot woman and told her, “Neither do I condemn you, go and sin no more” No condemnation of sinner, and no continuity of sin after meeting with Jesus. But the heresy of today will emphasize only on “no condemnation” they claim “God does not condemn us, God is merciful and loving, He does not condemn sinners” Yes that is true, but what about the later part of “go and sin no more” They ignore that, and that makes many to fall into heresy. It is important for us to examine our lives, as Christians, are we part of the Christians living in or preaching half-truth of heresy in this end time? The modern church of today is perverted by Satan to give people false hope, to give people half-truth, to make Christians overemphasize sweet part of the scripture and omit sacrificing part; to make Christians emphasize on promises of the Bible and ignore purity of the Bible, to make many focus on prosperity of this passing world and forget the preparation for the coming of the new and everlasting world. Are you among the deceived Christians of half-truth of heresy or you are among the deceivers of heresy? Half-truth of confession without repentance will lead to no genuine salvation. We hear message of salvation of today in many churches, from many preachers as “confess and be saved”. That people should just come, come and come, then, “ If you want to give your life to Jesus Christ and begin to enjoy the blessings, prosperity, deliverance and healing, all you need to do is to confess, say it after me ‘Jesus , I have come to you, I confess you as my Savior’ Now you are saved.” This process of confession without repentance will NEVER bring genuine salvation. That is the reason you hear funny things happening among them, because they don’t have genuine experience of salvation that is the reason such Christians will continue in sin even after they have been ordained ministers, because the foundation is false and faulty. How can you ask somebody to confess his sin without first telling him to repent? How can you say somebody is saved when the person does not understand what repentance is all about? Confession of sin without first repentance is half-truth that leads to heresy and hell. Because the preachers who preach confession of sin without repentance do not understand genuine salvation themselves or they want multitude. Christians whose foundation is based on confessions of sin without genuine repentance will always find themselves committing the sins they have confessed. Repentance will make somebody to count the cost before coming to Christ, that you must not only realize your sin, but you must make up your mind to forsake them, that you have the cross of self-denying to bear after you come to Christ, that Christian life is not about prosperity, prophesying but righteousness, truth and joy in the Holy Spirit. The half-truth of confession without repentance, of coming to Christ and continuing in sin at the same time is heresy of this end time, which every Christian who wants to make rapture must watch against. Confession of sins alone will not bring the mercy of God, but only those who repent, confess and forsake the sin they confess will experience unlimited mercy. Proverbs 28:13. The true Gospel of the Bible is full of grace and truth. The grace of God through Jesus Christ is no condemnation, that is the grace of the Bible – God’s favour, God’s power to live above sin and victorious over Satan. And the truth of the Gospel is to go and sin no more after we meet Jesus Christ. PERSONAL EXAMINATION- Please reflect on this teaching and pray to recommit your life to Jesus Christ, He is waiting for you. If you will like to be receiving our weekly articles by email, please, click on our website and subscribe for daily Christian articles rtemoutreach.org.